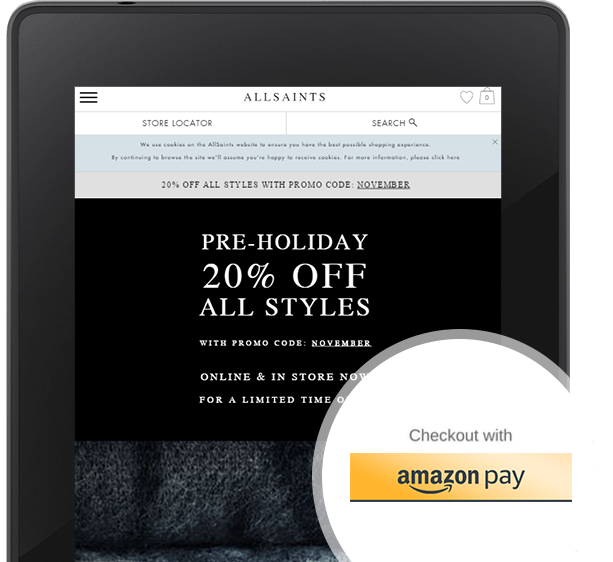 Iconic fashion retailer AllSaints increases checkout conversion by 34%, using Amazon Pay. Since integrating Amazon Pay, AllSaints has seen a huge increase in conversion. In addition, they’ve reduced checkout time dramatically — by 70 seconds. Customers are choosing Amazon Pay because it has made shopping on AllSaints faster, easier, and more secure. Within two weeks after launch, AllSaints saw 24% of customers choose Amazon Pay. In addition, AllSaints saw a 15% higher average order value. The sales figures show that customers are getting a better buying experience thanks to Amazon Pay. AllSaints is obsessed by doing everything themselves to ensure the best possible experience for their customers. They run all their operations in-house, build their own stores, weld their own furniture, have an in-house design team of 34 people to create their fashion collections and code their own website. Amazon Pay enables us to provide a really elegant digital experience that ensures our customers come to us again and again. The implementation process for Amazon Pay is simple, and takes a matter of weeks rather than the months it can take to implement many other systems. “Amazon was really easy to work with, and it made a real difference not having the headache of a big implementation, which demands a huge amount of resources and costs,” said James Wintle, Global Director of Technology at AllSaints. This case study reflects the results and experience of AllSaints. Individual results may vary.